When the word wasp is thrown around, the image that usually comes to mind is an ornery insect armed with a stinger and angry friends. While this is true in some cases, stinging social wasps are the rarity among their kind. The overwhelming majority of wasps are docile, solitary insects and many don’t even possess stingers. Wasps are one of the invisible cogs of the environment, as they perform incredible pest control services while staying mostly out of sight. They belong to the same order as ants, sawflies, and bees– a humongous group of insects that together make up almost 40% of the total insect biomass on Earth. 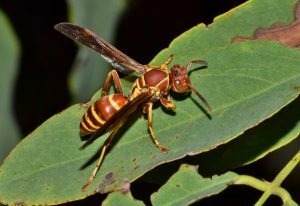 Wasps are present in multiple capacities in almost every ecosystem, and they are believed to be responsible for around half of all insect-on-insect predation. In short, if it were not for wasps, we would shortly be overrun by a plague of not only pest insects but all insects combined. Wasps have become some of the most effective predators on earth through several methods. Most wasps are what’s known as solitary parasitoids. This means that they live alone, and their young feed off of other insects by living on or inside them, killing their host in the process. Parasitoid wasps, like a mix between a ninja and a creature from a Ridley Scott movie, have evolved alongside specific prey for millions of years and as such know exactly how to place an egg on or in them. They then leave their young to grow and use their host as free transport and protection, until they eventually emerge to continue their lives. There are thousands of species of parasitoid wasps that prey on all types of insects. 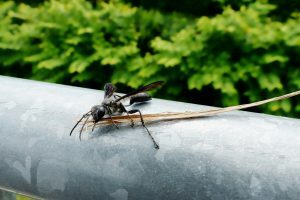 There is a very good chance that for every pest you find in your garden, there is a species of wasp working its tail off as free pest control. Solitary wasps come in all shapes and sizes but are usually very small, with the smallest known species being about as large as the period at the end of this sentence. Many of them possess an ovipositor instead of a stinger, which means that they lay their eggs through what looks like a stinger. Although these might look scary, they are engineered to allow the wasp to reach difficult areas in order to lay eggs and they cannot be used for stinging. For example some species listen for the vibrations of boring insects and use long ovipositors to pierce through inches of solid wood and precisely lay an egg on them. Solitary wasps are especially susceptible to pesticides, and by treating a pest outbreak with pesticides usually more damage is done to the beneficial wasps in your area than is done to the pests themselves. Exercise restraint when spraying for pests such as aphids, as sometimes leaving them alone for a few years can build up a population of parasitoid wasps that can keep pests in check completely on their own. Another type of solitary garden patroller is the hunting wasp. These wasps also live alone, but instead of using a host insect as a nest of sorts for growing young, hunting wasps make a nest of their own and provision it with prey for their young to eat. Most solitary hunting wasps nest in tunnels they dig into the ground, however some nest in wood while others make nests out of mud. Like parasitoid wasps, hunting wasps have formed close associations with specific prey. This has allowed them to instinctively know how to paralyze them with a single sting. The paralyzed prey is then taken back to the nest, where an egg is laid either on or nearby the prey and the room is sealed off. The unlucky victim is then left to watch as their hungry roommate hatches and begins to feed. While the inner workings of solitary wasps can become a bit grim at times, do not forget that these insects are quite constantly performing indispensable services to the world around us.